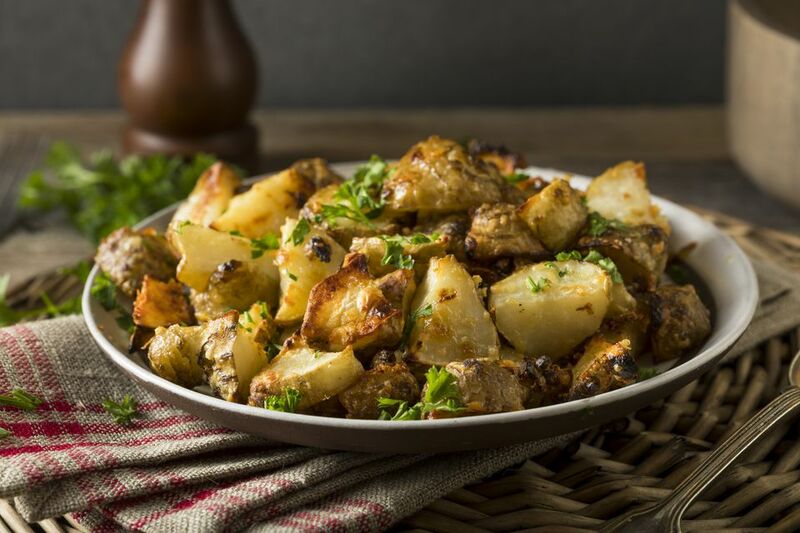 Here is a vegetarian and vegan recipe for oven-roasted sunchokes, also called Jerusalem artichokes. This roasted sunchoke recipe would make a nice alternative to oven-roasted potatoes for dinner anytime. The natural sweetness of the sunchokes is balanced by the saltiness of the soy sauce when roasting sunchokes, and the olive oil helps them stay moist while getting a nice crispy coating, much like oven-roasted potatoes. Sunchoke skin is edible, so feel free to leave it on and save the hassle of peeling it. Chop sunchokes into 1-inch chunks. Toss on a baking sheet or roasting pan together with olive oil and soy sauce, coating well. Roast sunchokes in the oven for 35 to 45 minutes, or until soft and lightly golden brown. Season with a bit of extra salt and pepper, if desired.